I keep coming across amazing tilt shift images. If you’ve never heard of this, it’s a photographic technique for creating a shallow depth of field (using lenses or digital post-processing) and can be used to turn a suitable photo into a fake miniature. There are many ways to do this using the digital post-processing route – many people do it in Photoshop, there are also online tools (e.g. Tilt Shift Maker). I thought I’d have a go at doing it in Aperture. After a bit of fiddling around and looking at an online Photoshop tutorial I have come up with the following steps to turn your image into a fake miniature using Apple’s Aperture. Let’s have a go and then compare with the image that tiltshiftmaker.com comes up with. 1. Choose a suitable image – a landscape with crisp definition and some feature of interest in the mid ground. 2. In the Adjustments tab, adjust exposure & brightness for clarity and then increase contrast, definition, saturation and vibrancy to create a rich, almost over-saturated look. You could also do a sharpen. 3. Optional step – do a gamma vignette (photos > add adjustment > vignette), this darkens the corners and enriches the colours a bit more. 4. Finally, apply the blur (photos > add adjustment > quick brushes > blur) and first off apply a strong blur (amount ~8) all over the image then using the selective remove tool from the HUD remove the blur in the area you want to focus on. You can then add another blur adjustment on top but this time reduce the blur to a lesser amount (~6), again apply to whole photo and selectively remove but from a small area this time. You can use brushes to add or remove blurring in specific areas of the image. And here’s the version that tiltshiftmaker.com produced from the same original image. 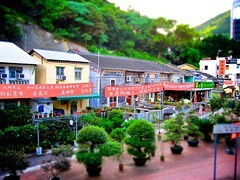 The photo is of Tai Po village, Hong Kong (courtesy of Susie). Thanks for the help here, this is exactly what I was looking for. Many thanks for this. I’ve searched high and low for a way in Aperture to create tiltshift without using a plug-in and when i find it, it’s relatively simple.